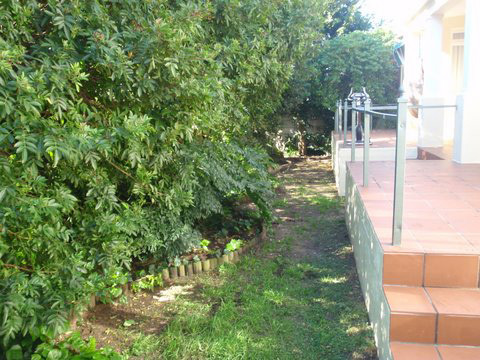 I’ve been going through hundreds of old photographs to find before pics to show you of how the back area of my garden looked when we first bought this house. It really was not attractive – it was already overgrown and was dominated by ivy, ferns and the trees! The only thing I regret is that the “gardener” I got to mow the lawn and “tidy up” the garden destroyed a huge, beautiful lavender bush we had in the back garden. Everything else was … well IVY and the delicious monster which Kathryn decided to keep in the garden. I’m still not mad about it, I may remove it one day, but for now I defer to her better judgement. After our magical day spent in Philadelphia yesterday with the kids and their families, I spent the best part of today working on this part of the garden – As I mentioned to you, I have a bit of an “ant problem” back there and aphids are attacking the Camellias, so armed with my organic pest repellent I’ve been spraying and then weeding, removing dead leaves, learning to prune … lots of work! Here is a current comparison in photographs. The way it looked before Kathryn worked her magic and a photo I took today. I do still hate seeing the house next door but the rate at which the trees are growing (especially the Viburnum that was planted), I’m confident that within a year I should have my privacy back. Not that they can see over their wall into my garden, but I just don’t like looking at neighbour houses from my garden. I uploaded a set of photos of the “progress” the plants have made to Flickr.com in case you are interested in seeing how its progressed. There is one that I took just after the new plants and lawn were planted, then one in October, one in December and then two photos I took today. 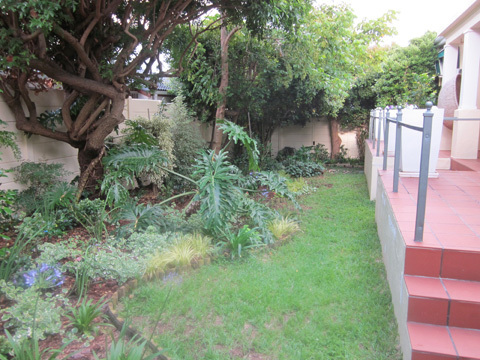 Here is the link: My Back Garden progress in photos. I’ll add more to the set as time goes by. Oh my word. The difference in the ‘before’ and ‘after’ pictures! Now I understand what you meant by overgrown. Can’t really tell where one plant starts and the other ends! What a very different and clean look of the after photo. I love it!